Prime minister Benjamin Netanyahu declared his support this month for the so-called “muezzin bill”, claiming it was urgently needed to stop the dawn call to prayer from mosques ruining the Israeli public’s sleep. A vote in the parliament is due this week. The use of loudspeakers by muezzins was unnecessarily disruptive, Mr Netanyahu argued, in an age of alarm clocks and phone apps. Israeli legislation ostensibly intended to tackle noise pollution from Muslim houses of worship has, paradoxically, served chiefly to provoke a cacophony of indignation across much of the Middle East. But the one in five of Israel’s population who are Palestinian, most of them Muslim, and a further 300,000 living under occupation in East Jerusalem, say the legislation is grossly discriminatory. The bill’s environmental rationale is bogus, they note. Moti Yogev, a settler leader who drafted the bill, originally wanted the loudspeaker ban to curb the broadcasting of sermons supposedly full of “incitement” against Israel. And last week, after the Jewish ultra-Orthodox lobby began to fear the bill might also apply to sirens welcoming in the Sabbath, the government hurriedly introduced an exemption for synagogues. The “muezzin bill” does not arrive in a politically neutral context. The extremist wing of the settler movement championing it has been vandalizing and torching mosques in Israel and the occupied territories for years. The new bill follows hot on the heels of a government-sponsored expulsion law that allows Jewish legislators to oust from the parliament the Palestinian minority’s representatives if they voice unpopular views. Palestinian leaders in Israel are rarely invited on TV, unless it is to defend themselves against accusations of treasonous behavior. And this month a branch of a major restaurant chain in the northern city of Haifa, where many Palestinian citizens live, banned staff from speaking Arabic to avoid Jewish customers’ suspicions that they were being covertly derided. Incrementally, Israel’s Palestinian minority has found itself squeezed out of the public sphere. The “muezzin bill” is just the latest step in making them inaudible as well as invisible. Notably, Basel Ghattas, a Palestinian Christian legislator from the Galilee, denounced the bill too. Churches in Nazareth, Jerusalem, and Haifa, he vowed, would broadcast the muezzin’s call to prayer if mosques were muzzled. For Ghattas and others, the bill is as much an assault on the community’s beleaguered Palestinian identity as it is on its Muslim character. Netanyahu, on the other hand, has dismissed criticism by comparing the proposed restrictions to measures adopted in countries like France and Switzerland. What is good for Europe, he argues, is good for Israel. Except Israel, it hardly needs pointing out, is not in Europe. And its Palestinians are the native population, not immigrants. Haneen Zoabi, another lawmaker, observed that the legislation was not about “the noise in [Israeli Jews’] ears but the noise in their minds”. Their colonial fears, she said, were evoked by the Palestinians’ continuing vibrant presence in Israel – a presence that was supposed to have been extinguished in 1948 with the Nakba, the creation of a Jewish state on the ruins of the Palestinians’ homeland. That point was illustrated inadvertently over the weekend by dozens of fires that ravaged pine forests and neighboring homes across Israel, fuelled by high winds and months of drought. Some posting on social media relished the fires as God’s punishment for the “muezzin bill”. With almost as little evidence, Netanyahu accused Palestinians of setting “terrorist” fires to burn down the Israeli state. The Israeli prime minister needs to distract attention from his failure to heed warnings six years ago, when similar blazes struck, that Israel’s densely packed forests pose a fire hazard. If it turns out that some of the fires were set on purpose, Netanyahu will have no interest in explaining why. Many of the forests were planted decades ago by Israel to conceal the destruction of hundreds of Palestinian villages, after 80 percent of the Palestinian population – some 750,000 – were expelled outside Israel’s new borders in 1948. Today they live in refugee camps, including in the West Bank and Gaza. According to Israeli scholars, the country’s European founders turned the pine tree into a “weapon of war”, using it to erase any trace of the Palestinians. The Israeli historian Ilan Pappe calls this policy “memoricide”. Olive trees and other native species like carob, pomegranate and citrus were also uprooted in favor of the pine. Importing the landscape of Europe was a way to ensure Jewish immigrants would not feel homesick. Today, for many Israeli Jews, only the muezzin threatens this contrived idyll. His intermittent call to prayer emanates from the dozens of Palestinian communities that survived 1948’s mass expulsions and were not replaced with pine trees. Like an unwelcome ghost, the sound now haunts neighboring Jewish towns. The “muezzin bill” aims to eradicate the aural remnants of Palestine as completely as Israel’s forests obliterated its visible parts – and reassure Israelis that they live in Europe rather than the Middle East. Where are the outcrys against this injustice? When a government removes its Bedouin citizens from their home in order to settle its own Jewish citizens in their stead, this is racist dealing. Dispossessing people of their land in order to plant a forest on that same land is inhuman. Had these Bedouins been Jewish settlers, the government certainly would not evict them before finding an alternative dwelling for them that would suit their demands. By its own acts the government of Israel proves that the UN’s outrageous ruling was not erroneous. Citizens of Israel who do not protest this extreme injustice in fact support the government in its racist policy. Why is it so important for the government to remove them from the localities it had settled them in? Anyone visiting Umm Al Hiran will see a vast, empty area all around. But apparently the government of Israel has decided to create a Jewish settlement, named Hiran, right where it once settled the Bedouin inhabitants of Umm Al Hiran. And plant a forest right where the government of Israel once settled the inhabitants of Attir! The question is why does the government of Israel do this. Unfortunately, the simple answer is because it can. Because there are not enough citizens who oppose such racist policies. The UN General Assembly once came out with an outrageous declaration, ruling that Zionism is racism. The insult was severe. How could once accuse the State of the Jewish Peoplel – who had suffered so long from racism – of racism? Indeed, a few years later the UN General Assembly revoked its own outrageous ruling. In the 1980s the Isrsaeli Knesset (parliament) legislated a law against racism. I fear that this law is actually against racist incitement, not against racist deeds. The law in fact protects all the racist deeds committed by the government. No one may demand to outlaw the Israeli government because of its own racist acts. Reaching out to Best Buy shoppers on Black Friday with materials and information about HP’s role in human rights violations, protesters faced the rain for several hours to spread the word about Hewlett Packard’s involvement in the oppression of Palestinians. On the busiest shopping day of the year, protesters in New York City – hailing from Manhattan to Gaza – joined in the Black Friday kick-off of the International Week of Action against HP’s complicity with Israeli attacks on Palestinian rights, protesting outside Best Buy in Union Square. Samidoun Palestinian Prisoner Solidarity Network organized the protest, which highlighted HP’s role in providing servers and management systems to the Israel Prison Service that imprisons over 7,000 Palestinian political prisoners. Hewlett Packard is also involved in providing imaging equipment for Israeli checkpoints and ID cards, enabling the siege of Gaza, providing services to Israeli settlements, and supporting other occupation infrastructure. The New York City event is one of over 99 protests around the world between 25 November and 3 December demanding a boycott of HP and an end to HP’s involvement in deportations, incarceration and oppression in Palestine, the United States and around the world. These protests were organized in response to a call from the International Boycott HP Coalition and the Palestinian Boycott, Divestment and Sanctions National Committee (BNC). Several Zionist counter-protesters, including one person dressed in an Israeli military uniform, repeatedly heckled the protesters and attempted, yet failed, to provoke confrontations. Throughout the protest, demonstrators chanted loudly against HP and its complicity in the occupation of Palestine, urging shoppers to boycott Hewlett Packard technology products. A wide range of activists, groups and writers concerned with Palestine participated in the demonstration, while a group of youth from a video training class organized by Picture the Struggle interviewed participants. Picture the Struggle works to document justice movements, including the Black movement, in New York City, through video, photography and audio recording. Samidoun is planning to join and encourages all to attend the protest on Monday, 28 November in New York City in solidarity with Rasmea Odeh, former Palestinian prisoner and torture survivor facing persecution in the United States. A major hearing in her case to determine the entry of evidence relating to her PTSD after torture will take place on 29 November in Detroit, which is also the International Day of Solidarity with the Palestinian People. The Rasmea Defense Committee is organizing protests and buses to Detroit to support Odeh, while protests are taking place in Tampa, Tucson, Fort Lauderdale, Salt Lake City and elsewhere to demand justice for Rasmea. In New York City, protesters will gather at Zuccotti Park at Liberty Street and Broadway at 3:30 pm on Monday. The deceased Cuban leader and PLO chief Yasser Arafat enjoyed close relations and shared anti-imperialist ideology. Cuban President Fidel Castro greets Palestine leader Yasser Arafat, right, at a dinner reception. It’s November 1974, and Yasser Arafat, sporting his signature Ray-Ban sunglasses and checkered black-and-white headscarf, is waving to a cheering crowd on the tarmac of Jose Marti International Airport outside Havana. He descended from the Algerian Airlines plane that took him from New York City to the Cuban capital, where he was greeted and embraced by Fidel Castro, who was at that time prime minister and had been in power for 15 years. Castro died late on Friday at the age of 90, according to the Cuban government. The moment in Havana wasn’t the first time the two men had met – their initial encounter happened just over a year earlier at the 4th Summit of Non-Aligned Countries in Algeria. However, it was the first time they met on Cuban soil. Despite not being a head of state, Arafat was given a presidential welcome in Havana: Cuban Communist Party officials, ministers and others warmly welcomed the Palestine Liberation Organization (PLO) leader that day. Later on, he was awarded one of the country’s highest decorations, the Orden Nacional Playa Giron, or Bay of Pigs Medal, which, according to Cuba’s government radio, is “awarded to Cuban citizens or foreigners who have excelled in the struggle against imperialism, colonialism and neo-colonialism, or who have done great deeds for peace and progress of mankind”. The iconic picture of Arafat and Castro walking on the tarmac – housed at the Yasser Arafat Foundation in Ramallah – tells the tale of how an unlikely relationship between the two men, and the PLO and Cuba, were forged. And while Cuban-Palestinian relations can be traced as far back as the 1966 Tricontinental Conference in Havana, it was Arafat’s November 1974 trip that “cemented the official Palestinian relationship with Cuba”, said Hosni Abdel Wahad, the Palestinian Authority’s assistant foreign minister for the Americas. It is believed that unofficial ties were made between Cuba and the Palestinians during a first-of-its-kind trip by Fidel’s brother, Raul Castro, and Che Guevara to the Gaza Strip in late 1959. Events in the 1950s set the stage for this trip: during that time, all Latin American countries, with the exception of Cuba, consistently supported the Israeli position over that of the Palestinians in international forums. Che Guevara, who was not Cuban but was an instrumental figure in the country’s revolution, spoke in support of the Palestinians in the coastal enclave and elsewhere. This culminated in Cuba’s recognition of the PLO when it was founded in 1964, making it one of the first countries to do so. The Cubans trained Palestinian cadres, and Fidel himself was a staunch advocate of the Palestinian quest for freedom and independence. Many of Arafat’s pictures at the Yasser Arafat Foundation, which traces and commemorates the life of the late Palestinian leader, attest to a close relationship with Fidel Castro and Cuba. The mostly black-and-white images document a series of visits by Arafat to the Latin American country – by some accounts, as many as eight; and these are just the official ones, said Mohammad Odeh, who heads Fatah’s Latin America department. “That’s a significant number considering Cuba is such a geographically distant country. Mansour Tahboub, former acting director of the Arafat Foundation, said such visits were also a testament to the close historical ties. “Cuba has always been a strong supporter of Palestinians in all realms: political, military, vocational training,” Tahboub said. The rare archival footage at the foundation provides a window into many milestones of Cuban-Palestinian relations, such as Arafat pictured on stage – with former Syrian president, Hafez al-Assad, in the background – condemning Egypt for signing the 1978 Camp David Accords with Israel, during the 6th Non-Aligned Summit in Havana in September 1979. During that time, Egypt was suspended as a member of the Non-Aligned Movement after its agreement with Israel was criticised as “an act of complicity with the continued occupation of Arab territories”. But these pictures show only a portion of the decades-long relationship between the two men. The PLO and Cuba were natural allies, as both championed what their leaders saw as a struggle against imperial and colonial powers. Indeed, Castro conflated Cuba’s “strife to fight imperialism” with the Palestinian quest for independence from Israel’s occupation. “Cuba’s backing of the Palestinians wasn’t exceptional,” explained Abdel Wahad, who studied journalism in Cuba. Castro reaffirmed this belief on numerous occasions, including during an interview with the French weekly Afrique-Asie in 1977. In almost every one of Castro’s many speeches, he voiced support for the Palestinians alongside condemnations of US “imperialist plots”. Following the end of the Six-Day War, Cuba condemned Israel for the first time at the UN. And of all the Latin American countries that had PLO representative offices at the time, only Cuba and Nicaragua granted the PLO full diplomatic status. Yet despite its close relationship with the PLO, Cuba continued to maintain relations with Israel until 1973. It was during the Non-Aligned Movement summit of that year in Algeria that Cuba announced it would break off relations with Tel Aviv. Several historical accounts refer to a dramatic scene unfolding at the event after Castro was reportedly convinced to cut ties with Israel. Tales were told of an embrace between Castro and former Libyan President Muammar Gaddafi, and some claimed that “Arafat ran across [the hall] to embrace Fidel, and the applause lasted for minutes”. During the Non-Aligned Movement’s heyday, before the end of the Cold War, Cuba also gave much-needed political support to the Palestinians in international fora, such as the UN. Around that time, Cuba co-sponsored the UN General Assembly resolution that equated Zionism with racism. Even when the UN later repealed the resolution in 1991, Cuba stood in opposition. Some argued that the prominence Cubans gave to the Palestinian cause was a quid pro quo for helping the Castro government secure influence among “Third World nations”. “The symbiotic relationship between the two … enabled Castro, despite his role in Latin America and Africa as a Soviet client and surrogate, to assume a leadership position in the Third World and within the Non-Aligned Movement,” wrote David J Kopilow, a former consultant for the Hudson Institute in Washington specialising in Central America. Cuba assisted the PLO – especially left-leaning factions like the Popular Front for the Liberation of Palestine (PFLP) and the Democratic Front for the Liberation of Palestine (DFLP) – in forging ties with neighbouring states. The Cubans had a huge role in us seeking the status of non-member observer state, and we still liaise with them on all high-level international matters. “The Cubans played a vital role in facilitating our interactions on the Latin American scene,” said Hisham Abu Ghosh, a member of the DFLP’s political bureau. The DFLP had an especially close relationship with the Cuban regime; the party’s leader Nayef Hawatmeh made dozens of trips to the island, the most recent of which was made in November 2013. The PLO also found fertile ground in Cuba for political training and support, giving “logistical and professional guidance for Palestinian factions”, according to Abdel Majeed Sweilim, professor of political science at Al Quds University. The Latin American state also took a special interest in providing educational support to Palestinians. “Despite Cuba’s economic woes, the government would give more than 150 Palestinians annually opportunities to study medicine, engineering and other disciplines,” said Odeh, who studied dentistry on the island in 1970 under a full scholarship granted by the Cuban government. Cuba was even consulted in the lead-up to the UN’s recognition of Palestine as a “non-member observer state”. “I was in Cuba two years ago to consult with officials about the UN bid,” Fatah’s Odeh said. One of Israel’s most prominent broadcasters says Israeli leaders are welcoming the resurgence of white nationalism and anti-Semitism in the United States that has accompanied Donald Trump’s winning presidential campaign. London elaborates on why the rise of white nationalism, a political movement many of whose adherents openly identify with the Ku Klux Klan and even Nazism, would be seen as beneficial to Israel. “To do the Netanyahu government justice, let me qualify my statement by saying that all forms of Zionism hold the perception that a certain extent of anti-Semitism benefits the Zionist enterprise,” London writes. “To put it more sharply, anti-Semitism is the generator and ally of Zionism,” London states. This is something Israeli leaders understand well, which is why they have exploited recent mass atrocities in France to urge Jews to emigrate from Europe. Such views will shock anyone who does not know the long history of collusion between Zionism and anti-Semitism, which Columbia University professor Joseph Massad explains in a 2013 article for Al Jazeera English. Al Jazeera promptly took the article down, later restoring it, after an uproar over its blatant act of censorship. It remains to be seen whether Goldberg will denounce Yaron London for actually welcoming anti-Semitism. Indeed, such has been the enthusiasm of Israeli ministers for the incoming Trump administration that Prime Minister Benjamin Netanyahu had to issue a directive ordering his cabinet colleagues to stop trying to make contact with the president-elect’s team. This came after education minister Naftali Bennett spoke at a New York gala of the Zionist Organization of America (ZOA) on Sunday, which Trump’s chief strategist Steve Bannon was expected to attend. Spencer has also hailed Trump’s presidential campaign as a vehicle that has helped usher his fringe movement increasingly into the mainstream. Despite the reports about Bannon’s promotion of anti-Semitism, the Trump adviser has been embraced by Israeli leaders, including the head of a West Bank settler council, as well as by agriculture minister Uri Ariel. “While we do not know each other personally, dear friends of mine including Rabbi Shmuley Boteach have shared with me your strong opposition to the Iran nuclear agreement, which threatens Israel’s survival, your opposition to BDS [boycott, divestment and sanctions] and your opening of a Jerusalem bureau in Israel while head of Breitbart in order to promote Israeli point of view [sic] in the media,” Ariel adds. As for Uri Ariel, he is a leading supporter of extremist Jewish settler groups who, with support from the Israeli government, aim to destroy the al-Aqsa mosque in Jerusalem and replace it with a Jewish temple. Zionist Organization of America leader Morton Klein told the Tel Aviv newspaper Haaretz that Bannon had been expected at his organization’s gala on Sunday, and that Trump himself might have shown up. But Klein said that the hundreds of protesters outside, many young progressive Jews from groups including IfNotNow, had deterred Bannon from showing up. The gala was nonetheless a who’s who of pro-Israel extremism in the US. Participants included former Harvard law professor and Bannon defender Alan Dershowitz as well as Sheldon Adelson, the billionaire funder of anti-Palestinian causes. Meanwhile, journalist Dan Cohen noted that “the Jewish generational divide” was clearly visible in the difference between the predominantly older attendees at the ZOA event, and the youthful protesters outside. What is also apparent is the growing political divide. On one side there are those who are willing to support Israel and Zionism at any cost, even if it means openly allying with Islamophobes, white supremacists and anti-Semites.On the other side, are all those, including Palestinians and Jews, united against this open embrace of the most poisonous forms of racism. What you are about to witness is historic; it is the will of the people to act collectively and in the service of the public good. President-elect Trump, this is very awkward. I did not vote for you, but I find myself with a burning desire to thank you from the bottom of my heart. You may be unaware, but by winning this election you have unleashed and unified progressive voices from every corner of American society. The same unifying phenomenon is taking place in all corners of the world. It would have never happened without you. If it was not for you, we would still be buried in mediocre politics-as-usual, with the majority of citizens totally uninterested in getting involved, and even more people willing to suffice with being keyboard activists. So, thank you Mr. Trump. When all is said and done, I promise you that Bernie Sanders is going to look like a Wall Street conservative. What you have set in motion may not break the two-party monopoly in US politics, or even bring the Democratic Party to its senses, but what you are about to witness is much more ground-breaking: it is the will of the people to act collectively in the service of the public good. I’m an American from Youngstown, Ohio. You will recall this city because it’s made history a few times. In the first half of the twentieth century, we were the heart of the US steel industry, part of the Steel Belt. My maternal grandfather worked a furnace at one of the mills. At the time, this economic boom attracted a lot of immigrants, my father being one of them. Then, much of the steel industry moved production overseas. In no time, we became known as part of the Rust Belt. We’ve never recovered, but we keep fighting. My sister still lives in Youngstown and is a Licensed Professional Counselor at a private psychiatric clinic and reports that work has never been busier, with more people seeking mental health care for anxiety and fear of the future. The largest increase in her clients has come since your election on November 8 and has been children, unable to find comfort in their parents’ words. The kids are trying to reconcile how it’s now acceptable to make racist and sexist comments and to make fun of the disabled after being taught that such behavior is unacceptable. I’m also a Palestinian. My father was born and raised in Al-Bireh/Ramallah, Palestine. He left to the US before the 1967 war. Once the war was over, Israel prohibited any Palestinian who was abroad from returning home. Consequently, my father built his life in Ohio, running small businesses and employing people for decades. After the 1993 Oslo Peace Accords were signed between the Palestinians and Israelis, I relocated to my father’s birthplace to help end the Israeli military occupation and build the state of Palestine. My tools of resistance were, and remain, economic development and education. In addition to being a Palestinian-American and businessperson, I’m also a long-time rights activist. Social and economic justice and peace are not just slogans to me. I grew up in a household that taught if you see injustice, don’t just talk about it, work to do something to change it. I must be honest with you; in the two worlds where I operate, Palestine and the US, things were getting rather stagnant. It has been like pulling teeth to get people to get up and activate themselves in their civic duties, be it resisting the Israeli occupation or bringing hope and jobs back to US inner cities. Organizations were so stuck that one wondered if they had been reduced to serving as employment vehicles, bereft of any drive to advance the greater good. But this has all changed, thanks to you. I have never seen so many young people wanting to understand the political system, becoming engaged and mobilizing to act against what they expect will be your administration’s implementation of the demagogic rhetoric that you repeated ad nauseam on the campaign trial. The New York Times columnist, Nicholas Kristof, put together a good starter for people to get up and get busy, A 12-Step Program for Responding to President-Elect Trump (Nov. 17, 2016). I can’t even start to explain to you the communications happening in activist circles everywhere. I’m hearing from so many Latinos Americans, Jewish Americans, Arab Americans, and African Americans, who are expressing that they stand ready to mobilize against any racist polices coming from you, that I have lost count. For decades now progressives have failed to build a mega mailing list of all the progressives out there, but you seem to be coming to the rescue again with your proposed Muslim Registry. Many of my Jewish and Christian friends are waiting for this to happen so they can add their names to this registry along with mine. This will be such a service to the progressive community. Thank you again. Given that the holy days of Christmas are approaching, and as an expression of my gratitude for your unifying skills, I wanted to gift you something from Palestine, the Holy Land. It sounds like a straight-forward task, but living under Israeli military occupation makes it a bit complicated. First, I wanted to upload to my mobile phone and message you this beautiful Christmas card of the nativity scene in Bethlehem. It represents the scene of the birth of Jesus. You are aware that the Church of the Nativity and the city of Bethlehem are in the State of Palestine? Of course you are. Well, it did not work. The file requires data communication service on my mobile phone and Israel blocks the ability of Palestinians to have any legal access to 3G or 4G. So, I scrapped that. Next, I found this beautiful Palestinian embroidery scarf that I thought your wife Melania would literally fall in love with. I stopped at my local post office to see if it would make it in time for Christmas and learned that I was late, by 6-9 months. Yes, our postal system is under Israeli military control, so although I can go to my neighborhood post office, be served by a Palestinian postal worker, purchase beautiful Palestinian stamps, and send the package on its way, the package will need to pass through Israeli security and bureaucratic control. That means a simple package from Palestine to New York could take months on end. So, I scrapped that. Having failed thus far, I got a little bolder. I thought, why not just get a ticket and jump on a plane and deliver the gift in person? I’m sure my mother in Ohio would love to see me too. Then reality hit again, our Jerusalem airport in Qalandia, located at the northern tip of Jerusalem, is under total Israeli military occupation and off limits. So, flying from the West Bank is impossible without an operational airport. Then I thought, no problem, I’m a US citizen, I’ll just fly from Israel’s airport in Tel Aviv, as I did for most of my life. Reality hit again. Although I was born and raised in Ohio and am only a US citizen, Israel refuses to recognize me as an American because they issued me a West Bank residency card. Yes, Israel, our strategic ally, is the only country in the world, and that includes Iran and North Korea, that outright discriminates against American citizens based on their backgrounds. So, like all Palestinians under Israel’s occupation, I’m prohibited from using Israel’s airport. The Democrats were told all about this blatant discrimination by Israel and did nothing but pay lip service to Israel, but I’m sure your administration will get Israel back in line with common sense. Finding myself at a loss on how to get a gift to you in the normal ways, I chose to write you this public thank you and invite you to Palestine once things settle down for you. I can’t wait to show you what a real refugee camp looks like, how Israeli checkpoints humiliate thousands of Palestinians daily, how Israeli settlements are acts of sustained violence, how Muslims and Christians live peacefully in the same towns, how our US tax dollars to Israel are being used, and so much more. I also want to show you how a people under five decades of military occupation strives to build for the future, despite all odds, hoping the international community, especially the US, will stop being blind to Israel’s illegal actions. No need to bring your checkbook on this trip as no amount of money can resolve this bitter reality. It merely requires political will to hold Israel accountable. As we await your arrival, we’ll be mobilizing across America and Israel—Christian, Jewish and Muslim—to make sure the ground is ripe for action on the day you enter office. Merry Christmas and Happy New Year from Palestine. I don’t think anybody should be called or accused of being anti-Semitic unless the evidence is overwhelming. An anti-Semite is acceptable if he supports the Zionist State of Israel. I think we have to be very careful before we accuse any particular individual of being an anti-Semite . . . And I think one has to be very careful about using the term anti-Semitic. But “care” about using the words anti-Semite has never been the hallmark of Dershowitz’s long career as a polemicist. Was he being “careful” when he said that Black Lives Matter was guilty of an anti-Semitic “blood libel” in charging Israel with genocide against Palestinians? Was he “careful” when he likened Judge Richard Goldstone to Nazi Dr. Mengele after Goldstone put out a report highly critical of Israel in 2009, which Dershowitz termed a “blood libel”? Was he practicing “care” when he flatly described the late Harvard President Nathan Pusey as an anti-Semite in his book Chutzpah, and accused the entire American legal profession of anti-Semitism? Was the evidence “overwhelming” with Jimmy Carter and Desmond Tutu — when Dershowitz accused them of mainstreaming anti-Semitism because they were critical of Israel? And said that Carter had the “blood of thousands” on his hands? The evidence certainly suggests that Mr. Bannon has very good relationships with individual Jews. My former researcher, Joel Pollak, is an Orthodox Jew who takes off the Jewish holidays, who is a committed Jew and a committed Zionist, and he has worked closely with him. He has been supportive of Israel. Is that the one and only criterion of whether someone is an anti-Semite or not? Being supportive of Israel? I think it might be. So, I haven’t seen any evidence of personal anti-Semitism on the part of Bannon. I think the [Breitbart] headline about a Conservative Republican being a renegade Jew was ill-advised. But it doesn’t suggest to me anti-Semitism. It suggests to me a degree of carelessness. Dershowitz goes on to apologize for Trump. I think the larger problem – and it’s a very complicated one today – is how you assess a person who himself might not have negative characteristics, but who has widespread appeal to people who do. And I think that problem exists on the right and the left. I think there are left-wing candidates who appeal to some of the worst bigots on the hard left. Anti-Semites on the hard left. Anti-Israel people on the hard left. And I think the same thing is probably true of some very right-wing conservatives who appeal advertently or inadvertently to people whose values they probably themselves don’t agree with. He is obviously worried that Trump may not be pro-Israel, and so he is sucking up to him. But it is not legitimate to call somebody an anti-Semite because you might disagree with their policies. Or because in one instance, like in the Bannon case, an aggrieved wife in a divorce may have said something which he himself has denied having said. I think you always have to have a presumption of innocence and of good faith. “Innocence” and “good faith?” Doesn’t that describe Students for Justice in Palestine, who Dershowitz has not hesitated to call anti-Semites? And what about anyone who supports Boycott, Divestment and Sanctions (BDS) against Israel — Dershowitz has accused them too of anti-Semitism. Meanwhile, on the streets of New York …. On Sunday night, 11/20/16, many hundreds of people gathered in front of NYC’s main library at Fifth Avenue and 42nd St. to protest the Zionist Organization Of America (ZOA) invitation to Steve Bannon, an anti-Semitic white nationalist and a current member of Trump’s incoming administration, to speak at their annual awards dinner. The principle of the ZOA appears to be that an anti-Semite is acceptable if he supports the Zionist State of Israel. The hundreds of protesters came from a wide variety of Jewish organizations as well as individual participants. There were secular Jews, religious Jews, civil rights activists, youth and older citizens. And in Occupied Jerusalem …..
Mamilla cemetery does not exist anymore. What exists now is a hotel, a school, a parking lot, a public garden, a nightclub and the US consulate. Also a museum to celebrate tolerance. But the meaning of tolerance in West Jerusalem, a few steps away from the Old City, is surreal — to build the story of a new Jerusalem, the Israeli authorities are erasing its past. The Sabra Dipping Company has issued a voluntary recall of some of its hummus and other Middle Eastern spreads over a possible listeria contamination. “We want to reassure our consumers that our procedures include extensive finished product testing, and no products tested positive for contaminants. We are taking action because consumer safety is a top priority,” the notice also said. The company we conducted what it called “a thorough and extensive factory-wide cleaning and sanitation procedure,” and has been inspected by the U.S. Food and Drug Administration . A full list of the affected products, with a “Best Before” date up through January 23, 2017, is available on the recall page of the company website. Although no illnesses caused by the hummus have been reported, Listeria monocytogenes can cause serious and sometimes fatal infections in young children, frail or elderly people, and others with weakened immune systems. Healthy individuals may suffer only short-term symptoms such as high fever, severe headaches, stiffness, nausea, abdominal pain and diarrhea. In April 2015 the company issued a voluntary recall of 30,000 cases of its classic hummus due to a possible listeria contamination. Will Donald Trump Require Muslims To Enter National Registry? He has often been critiqued for his work and at times, it has garnered some unsavoury responses from people who believe his art is too controversial. 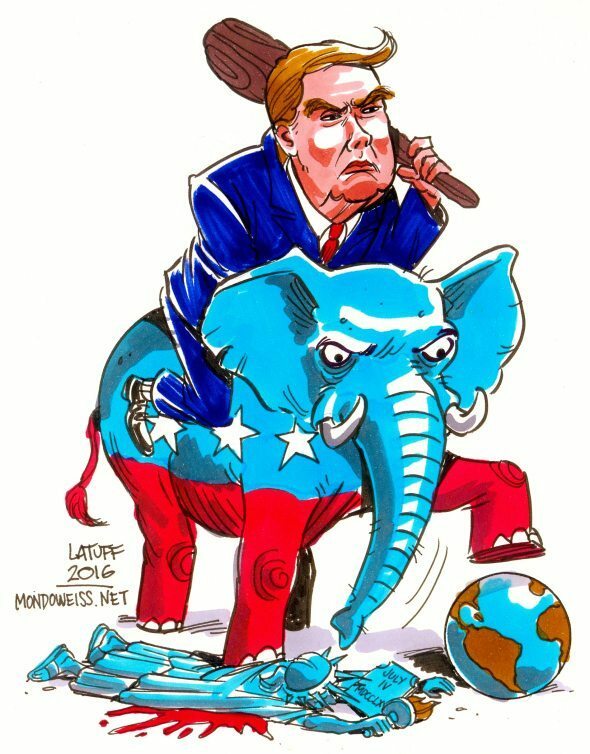 In an interview with the political cartoonist Carlos Latuff, he shares his thoughts on the new President-elect of the United States, his place in the media and his art being a mouthpiece for oppressed minorities across the globe. Q. First things first, President Trump. How does that make you feel? A. I tend to agree with Slavoj Zizek on this one; maybe a Trump victory will be the necessary reality check that the US society needs. Decades of governmental co-optation made the social movement something immobilized by the bureaucracy. A majority of social movements forgot the streets and started to bet their futures in the hands of politicians. What could be better for a country where Black people used to be hanged in poles and trees than having the first Black president? But in fact, what really changed? Did police stop killing Black people because you had a Black president? With Hillary, all the masks would stay the same whereas with Trump, they’ll fall piece by piece, and to say the least, it will be an ugly face with no make-up. Q. The media has extensively addressed your work and praised you for being courageous and unapologetic in your stand with oppressed groups all over the world. In your own words, how would you describe the work that you do? A. I would describe it very basically as art, paired with conscience and opinion. Q. Many people would say that cartoons are an out-dated way of making a political statement. Why is it that you choose to still do so, and do you think that it is still as effective as it may have been in the day of print media? A. The power of political cartooning on expressing complex issues in a nutshell remains the same, because no matter if it’s printed or found in online media, images are always effective on addressing a message, whether it’s a good one, or a bad one. Remember the Mohammed cartoons for example? In Turkey you have people arrested for making cartoons. I could be arrested in Egypt for making cartoons about Sisi and the military junta. Q. Early on in your life, what was it that led you down the path of activism; would you attribute it to your parents, or something in your youth, or simply what’s happening in the world? A. I’m actually not sure, as I have no activists in my family. Since I was a child, I had an interest in foreign affairs; I remember staying up for hours in front of an old short-wave radio listening to Radio Moscow or Radio France International, following news from abroad. It was so fascinating to me, and it may just have been that. Q. Your work has led to you being banned in countries like Turkey; what are your views on the media censorship that is permeating the world? A. Rulers usually aren’t fond of political cartooning, especially when artists expose them. In places like Turkey, that claim to be a democracy but where people are being arrested for sharing views on Twitter, free minders aren’t welcome, even there, where political cartooning has a long tradition. If you check the Cartoonists Rights Network International website, you may find other countries where, depending on what you will draw, you can be imprisoned or worse. I have myself been arrested three times for making cartoons against police brutality and corruption in Brazil. I have been threatened by a TV presenter in Cairo, I’ve had my cartoon blog blocked by Ankara and was labelled by a Zionist NGO in 2013 as one of the “world’s biggest anti-Semites” for a cartoon I made on Netanyahu and Gaza. Q. Leading on from that, in October you were contacted by Twitter due to a court order filed against you due to your work highlighting President Erdogan’s hand in the conflict in Iraq. Where do you stand on this issue, and has the case escalated since then? A. Erdogan is a dangerous character, not only for Turkey but also for the whole of the Middle East. He’s someone with megalomaniac dreams of being the new Sultan of Turkey, seeking support from Israel and Saudi Arabia to become a kind of regional Sunni leader against Iran. All the while, he is silencing dissident voices in his own land, especially that of the Socialists and the Kurds. Erdogan uses a Palestine-friendly rhetoric to fool the Muslim masses, whilst making agreements with the enemy of Palestinians, Israel! Erdogan is living proof of the dangers of having politics and religion mixing together. Q. Social media has been a breath of fresh air for those who may struggle to express themselves. What are some of the reactions you have received to the work you have produced? A. I’ve received lots of hatred. It ranges from those who support Israel, to the fan-boys of Syrian “moderate rebels.” However, I have received some real good feedback too, so c’est la vie! Q. You’re an extremely vocal opponent to the (illegitimate) state of Israel. Where do you see the future of the region? A. It’s hard to tell, but no solution is possible without recognition of Palestinian sovereignty. Much is said about “Israel’s right to self-defense,” or “Israel’s right to exist,” but not a single word about the rights of Palestinians. Q. In the past, Israeli groups and Zionist circles have issued death threats and labelled you as an ‘Iranian propaganda machine.’ Did this in any way worry you, or make you reconsider the work you do? A. No way! I gave my word to Palestinians when I was in the West Bank in 1997, and in the refugee camps of Jordan and Lebanon in 2009. I will continue supporting them all the way, no matter what may come if it. Q. The country of Saudi Arabia has once more become the face of human rights, as suggested by the United Nations. What are your thoughts on this? A. This is my response! Q. It’s quite interesting to note that your work is almost always published independently and yet still manages to leave a lasting impression and message. Do you ever aspire to see your work featured in mainstream news and media outlets? A. Sometimes I have cartoons reproduced by the global mainstream media; one instance is the piece I did regarding the Parisattacks. But I don’t think large newspapers would publish my cartoons, especially due to my views. Q. Publications such as Charlie Hebdo believe ridiculing important figures is ‘satire’ or ‘freedom of expression.” How do you respond to this, and how would you say your artwork differs from theirs? A. As I’ve stated many times in the past, you can criticize Muslim figures like Erdogan or Salman of Saudi Arabia, you can criticize the way Islam is manipulated for political reasons, but to mock the Prophet Mohammed seems more like a extreme-right provocation, as could be done by Pegida extremists or any Neo-Nazi group in Europe. Q. What legacy would you like to leave behind? How do you want to be remembered? A. I would like to be remembered as a friend of Palestinians, that’s all! As a Palestinian in Gaza, I have grown up feeling detached from the rest of the world as Israel tightens its decade-long blockade. I am sure many of you feel the same way. But we are not isolated. We are “soulmates” in the way that counts. Although we are of different color, religion, culture and place, I have learned, as I read about the protests at Standing Rock, that we have much more in common than differences. When I read your history, I can see myself and my people reflected in yours. I feel in my core that your fight is my fight, and that I am not alone in the battle against injustice. My ancestors were not the only ones who lived in Palestine. Jews, Christians and Arabs all lived side by side in my country. But my ancestors—including my grandparents and great-grandparents—were the indigenous people, just like you. And they suffered the same fate as your people. America’s policy of occupation and displacement through forced marches like the Trail of Tears, and the gradual transfer of so many of your people to massive, impoverished reservations, hurts me deeply because it is so similar to the ethnic cleansing of my ancestors by the Israeli military occupation in what we call “al-Nakba” (the catastrophe). We know what you know: that our land is sacred. In 1948, my ancestors—along with nearly a million other Palestinians—were frightened away or forced off their lands, in some cases at gunpoint. More than 10,000 others were massacred. Hundreds of our villages and cities were completely destroyed in a systemic plan to erase our identity—just as yours has been under continuing assault. Palestine today is just 22 percent of our original homeland. Like you, some of my people (an estimated 1.5 million) must live in degrading “camps” (our word for reservations), where living conditions are “comparable to the Third World.” Like your reservations, they are characterized by high rates of unemployment, poverty and suicide. When I was young, I saw how the media portrays negative images of you, especially in Hollywood films—depicting you as uncivilized, savage, racist and drug abusers. Likewise, my people are portrayed as terrorists, “backward,” misogynists and anti-Semitic. And yet no one regards whites as all the same. Like yours, our resistance has been labeled as acts of terrorism and violence rather than as a fight for survival and dignity. That’s not surprising, since this is the policy of every oppressor who seeks to criminalize others to justify its acts. It is the oppressor’s way to create its own version of reality to rationalize its behavior and brainwash the masses. And it is the oppressor’s plan to make the colonized feel weak and alone. But you are proving they won’t succeed and I want you to know that my people are with you. Seeing your women, elders and youth stand together to protest the pipeline and your exclusion from decision making is so inspiring! It gives us strength to go on with our own struggle. And here’s the situation two years from now …. A rise in hate crimes against Muslims and Jews contributed to a 6.8 percent overall increase in 2015 incidents from the previous year, according to the FBI. Olive harvest time is a traditional season for pogroms in the West Bank, but this was one of the most violent. A dozen masked settlers wielding knives and clubs and yelling ‘death to Arabs’ attacked five Palestinian farmers who were harvesting olives; ‘They came to kill,’ one victim says. The survivors are five congenial Palestinian farmers who speak broken Hebrew and work in construction in Israel, with valid entry permits. On weekends they cultivate what is left of their lands, most of which were plundered for the benefit of the settlements that choke their village, Janiya, outside Ramallah. They are convinced that they survived last Saturday’s attack only by a miracle. “Pogrom” really is the only word that describes what they endured. “We will kill you!” the assailants shouted, as they beat the men over the head and on their bodies with clubs and iron pipes, and brandished serrated knives. The only “crime” of the Palestinians, who were in the midst of harvesting their olives when the settlers swooped down on them, was that they were Palestinians who had the temerity to work their land. Olive harvest time is a traditional season for pogroms in the West Bank, but this was one of the most violent. No Israeli official condemned the assault, no one got upset. One victim needed 20 stitches in his head, another suffered a broken arm and shoulder, a third is limping, a fourth lost his front teeth. Only one managed to get away from the attackers, but he was also hobbled, when he injured his leg on the rocky terrain as he fled. The farmers, who days later were still in shock from the experience, were evacuated by fellow villagers; the olives remain scattered on the ground. Now they are afraid to go back to the groves. This weekend, they promised themselves, they will send young people from Janiya to collect what was harvested and to complete the work. They themselves, their bodies and spirits battered, say they are incapable of doing anything. The assailants, about a dozen masked settlers, are seen in a video taken by a local resident, Ahmed al-Mazlim, as they – apparently flushed with the excitement of their act – made their way back to their huts, which are scattered below the settlement of Neria, also known as North Talmon, between Modi’in and Ramallah. This was their “oneg Shabbat,” their Sabbath joy: descending into the valley and beating up people who were working their land, as innocent as they were helpless – possibly even with intent to kill. A peaceful weekend. The settlers are seen climbing slowly back up to the huts of their unauthorized outpost, which is planted on the hillside below Neria. They are not in any hurry – after all, no one is going to catch them. Finally they sit down on the porch of one of the huts to quench their thirst with a canteen. I’ve never before seen criminals leaving the scene of the crime with such indifference. Maybe they were exhausted from their labors – thrashing Arabs – tired but happy. Yotam Berger, the Haaretz reporter who was the first to publish the video, visited the huts the day after the pogrom. It was clear to him that settlers lived there, even though the structures were empty when he arrived. No arrests have been made so far, and past experience suggests that none will be made. The police are investigating. Janiya, a small village of 1,400 souls in the central West Bank, made a living from its lands until most of them were grabbed by the nearby settlements, beginning in the late 1980s. Few regions are as dense with settlers as this one; few villages have had as much of their land plundered as Janiya. Of the original 50,000-60,000 dunams (12,500-15,000 acres) owned by its residents, only 7,000 remain in their hands. The village is being suffocated. From a vantage point at its edge, we can view the valley in which the assault was perpetrated, and the nearby settlements. Our guide is Iyad Hadad, a field researcher for the Israeli human rights organization B’Tselem. Beneath us, the homes of Talmon A abut Janiya’s remaining lands, quite close to the villagers’ houses. Just stretch out your hand and touch them; one more expansion project and they’re inside Janiya. To the right – southeast – is the settlement of Dolev, on behalf of whose residents Israel blocked the main road to Ramallah for years. Perched on the hill opposite is Talmon B; next to it is Talmon C; and there, on the horizon, lies Talmon D. An Israel Defense Forces base stands on the top of the hill, at a distance. Every hilltop here poses another threat to the quiet village. Neria overlooks the olive grove belonging to the Abu Fuheida family and the terraced slopes leading down to it. The dwellings of the “hilltop youths” are scattered across the whole expanse, beneath the Talmons, dozens of meters apart from each other. It’s quiet in the valley. Some of Janiya’s olive groves now lie on property owned by the settlements; when they are harvested, it’s done in coordination with the Israel Defense Forces. For example, olives were picked in Palestinian-tended parts of Talmon A last week. But the attack by the settlers was perpetrated in a location where coordination isn’t required, because it’s not on the property of any settlement. This is the end of the harvesting season, and this is a wadi called Natashath. It’s Saturday morning, a beautiful day, and five members of the Abu Fuheida family – Sa’il, Hassan, Sabar, Sa’ad and Mohammed – descend to their family grove, where they have about 70 olive trees. It’s about 8:30; there are no other farmers around. They carry bags (“No knives,” one of them quickly makes clear) that are spread out on the ground to catch the fallen olives, along with a bottle of Coca-Cola, tomatoes, pita and cold cuts. This is not a good year for olives – the harvest has been meager. They work until midday, sit down to eat and go back to the ladders. Their plan is to complete the harvest by evening. But then the assailants sweep down out of nowhere; the harvesters, up on ladders, heads amid the branches, don’t see them. Only Sa’il, at 57 the eldest of the group and the only one not on a ladder, is able to get away, only to be injured in the course of his panicky flight. The villagers scampered down from the ladders, straight into the hands of the attackers, who grabbed Sabar first, then Hassan, surrounding them – a few settlers for every Palestinian – and walloping them. Sabar was the first to lose consciousness, Hassan says he also passed out. The pogromists tried to hit them on the head, but Hassan protected his with his hands. His right hand is now bandaged, stitched up and in a sling, four of his teeth were knocked out and his lip was cut, too. He is barely functioning and his speech is slurred. The attack went on for between five and 10 minutes. One of the cousins, Mohammed, managed to flee at one stage, after being slightly wounded, and he summoned help from the village. When the assailants left, the wounded were taken in ambulances and private cars to the Ramallah Government Hospital. Hassan relates that he regained consciousness in his brother’s house, where he had been taken by villagers before being evacuated to the hospital. He gets dizzy when he stands up. He was certain he was going to die, says Hassan, a construction worker in Rishon Letzion (“with a proper permit”).